This proposed mixed use development forms the 2nd Phase of the Hallsville Quarter master plan which in turn is part of the wider £3.7 billion Canning Town and Custom House Regeneration Programme. The brief included the provision of a Hotel, Health Centre and 250 Residential units above ground floor retail and restaurant uses. The scheme proposed housing these functions in a series of simple buildings that on one hand tie into the existing Phase 1 buildings on the eastern edge but also allow them to develop their own individual identities that relate strongly back to the historic building fabric of Canning Town. A thorough investigation of Canning Town’s social and historical context was an important first step in our approach to interrogating the wider master planning strategy and the role that this phase of the development plays within the wider redevelopment of the area. The architectural expression of the scheme sought to reference the vernacular identity that has developed in the area. 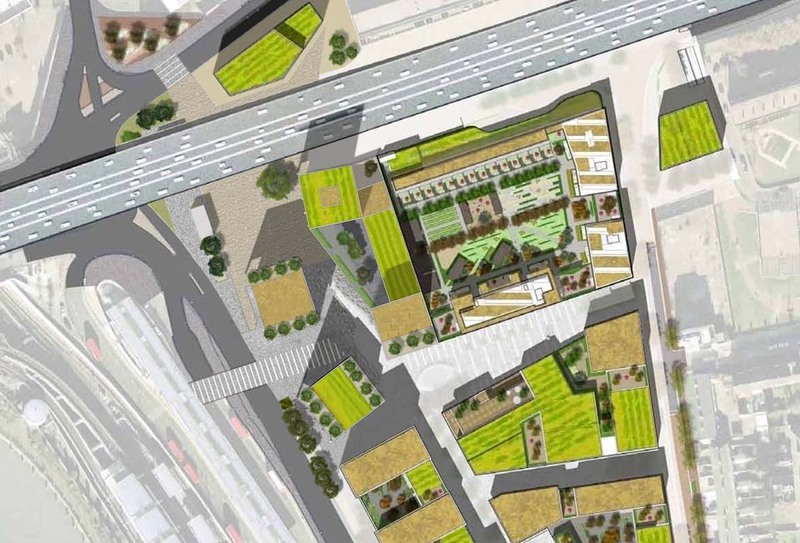 The layout of the scheme proposed the creation of a strong gateway to the development, whilst also reinforcing its presence alongside the A13 flyover and creating a strong new public space that stretches beneath it, bridging between the communities on either side. The scheme makes reference to the buildings of Phase 1, whilst also maintaining their own unique identities. The material choice and simple expression aimed to provide Canning Town with an architecture of permanence, timelessness, simplicity and aspiration. The creation of a pattern book addressed the key architectural components, this helped to create a unified language throughout the scheme that tied together the varying scales and functions of the buildings.